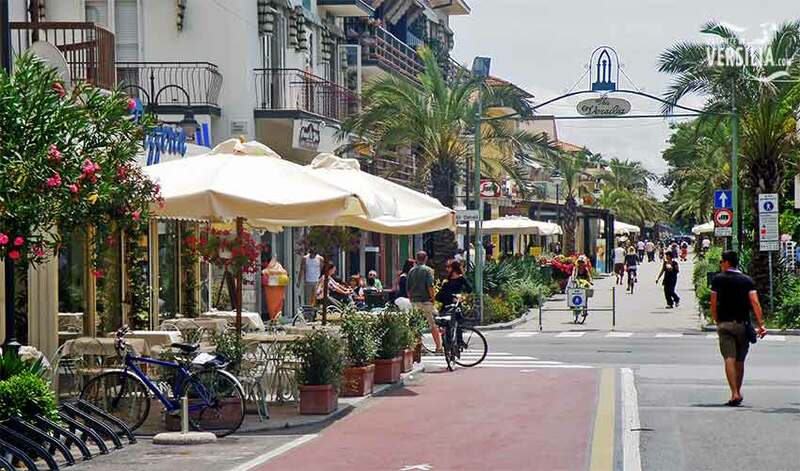 As a seaside resort Marina di Pietrasanta has a peculiarity: it owns, in an harmonious whole, the most beautiful natural beauties. Each of these, if considered by itself, could be vaunt of every tourist resort. The sea, the beach, the pinewoods and the mountains are the elements that, in a range of few kms, offer a wonderful landscape in an atmosphere of quite relax. 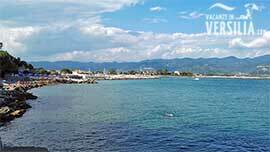 Marina di Pietrasanta comprehends Focette, Motrone, Tonfano and Fiumetto (from the south to the north). The first emotion the guest gets in arriving in Marina di Pietrasanta derives from the sight of the beach and the sea. A wide and sandy beach stretching for about five kms, so large in some points to reach 200 mts; a transparent blue sea whose depth degrades sweetly, so that it seems to be too familiar even to the most unskilled of the swimmers. The spaciousness typical of this shore is such that, even during the most crowded periods, the bathers feel completely comfortable thanks to the space available to each of them. More than 100 are the bathing establishments along the coast. They are perfectly equipped and easily reachable passing through a row of gardens. Just after the coastal Avenue is the inland street-network. Parks and gardens have been put between the urban settlements: that is the reason why they appear much more similar to a residential area than to a city. Focette, Montrone and Fiumetto are some examples. Built in a big pinewood, these centres are made by elegant villas and hotels surrounded by the greenery; they own suggestive roads, tennis-courts surrounded by pinetrees, shops and famous night-clubs where international-level shows are organized. Tonfano has much more urban characteristics. It hosts the town-centre and the main tourist equipments. 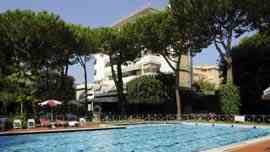 From Fiumetto, northwards of the Appia Avenue, nearby Forte dei Marmi, is the Versiliana Park. (about 1.000.000 quad kms). This park belongs nowadays to the town. In summer qualified cultural programs (prose, dance, music, cinema and cabaret) take place in the big pinewood surrounding the famous villa where the poet D'Annunzio had lived. A rectilinear tree-lined Avenue starts from Fiumetto towards the inland in order to joint this place to Pietrasanta (3.5 kms), a town situated between the Aurelia Avenue and the Apuan Alps. Capezzano Monte, Capriglia, Strettoia, Montiscendi, Vallecchia, Valdicastello, Marina di Pietrasanta, Solaio, Vitoio, Castello, Africa, Macelli, Crociale, Ponte Rosso, Traversagna.